The trapdoor spider is a common name for several of these large, harmless spiders that usually nest and live out their lives underground. They make holes or burrows in the ground, line them with silk which they spin, and add a hinged, accurately fitting trapdoor, which is usually made of layers or earth and silk. The opening of the burrow is covered by dirt or gravel, this disguises the entrance to the trapdoor spiders' lair. Trapdoor Spider burrow with the door opened. The most common species in the Southwestern United States digs holes about 1 inch in diameter and 12 inches in length. They grow up to around 1 inch, their mouthparts consist of a pair of downward pointing fangs for piercing, crushing, and digging. They have 4 pairs of simple eyes. Normally they live around 1 to 2 years. Spiders are predatory invertebrate animals with two body segments, eight legs, and no chewing mouth parts and no wings. They are classified in the order Araneae, the study of spiders is called or known as Arachnology. All spiders produce silk, a thin, strong protein strand that comes out of the spinnerets. They are mostly found at the end of the abdomen. Most spiders use their webs in order to catch food. Silk webs can be used to help them climb, form burrows, build egg sacs, wrap prey, and for a short amount of time, hold sperm. Not all spiders capture their prey with webs. Most, about 150 species of spiders, can inject venom to protect themselves or to kill their prey. Only about 200 different spiders have bites that can cause health problems for humans. Most larger spider species bites can be painful but will not have a lasting effect on human health issues. Male trapdoor Spiders come out during humid weather in order to mate. Mating usually takes place in the female's burrow. The female trapdoor will lay her eggs several months after mating, and protects them while they are in the burrow. The juveniles remain in the burrow for several months before exiting their hiding place. Spiders reproduce with eggs, which are usually packed into silk egg sacs. They mate if the approach signals are exchanged correctly. 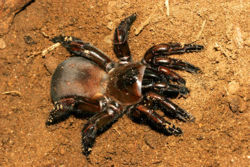 The male trapdoor spider must leave after mating to escape from the female's predatory instincts, which usually means the male is going to be killed by the female. When a male trapdoor spider is ready to mate he spins a web which he discharges his seminal fluid inside the web. Copulation occurs when the male trapdoor spider inserts one or both palps full of seminal fluid into the female spiders genital opening, called the epigyne. He inserts his seminal fluid into the female by expanding the sinuses in his palp. The female stores the males sperm inside a chamber and this chamber is only used during the egg-laying process. When the male sperm comes in contract with the eggs they are automatically fertilized. Trapdoor spider coming out of its burrow ready to catch its prey. Trapdoor burrowing deep below the ground. This page was last modified on 9 January 2009, at 20:17.